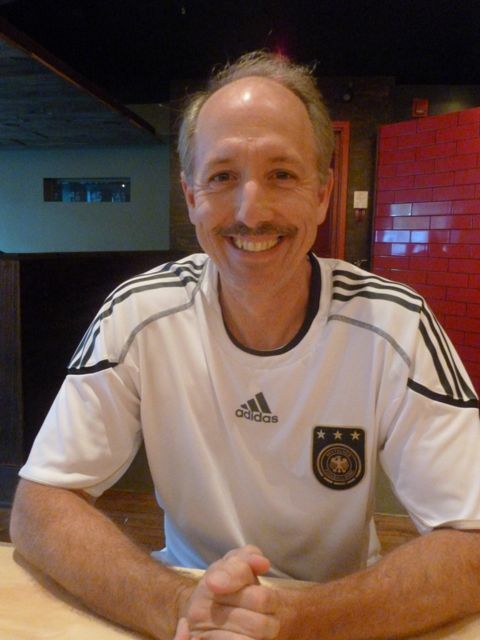 Joseph Mallozzi's Weblog: August 27, 2011: Wvrst! Geek Fest! 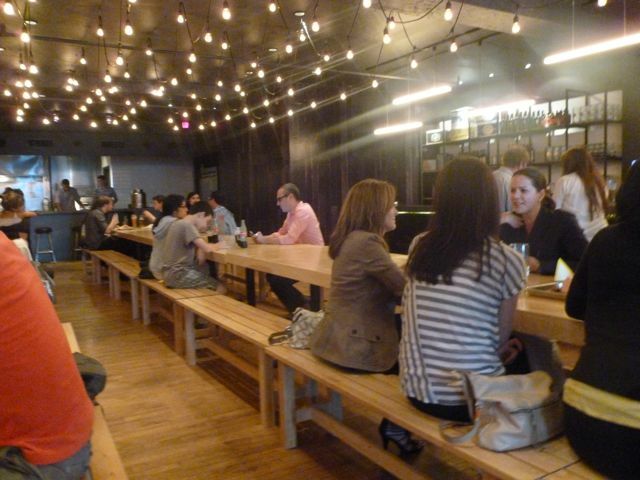 August 27, 2011: Wvrst! Geek Fest! 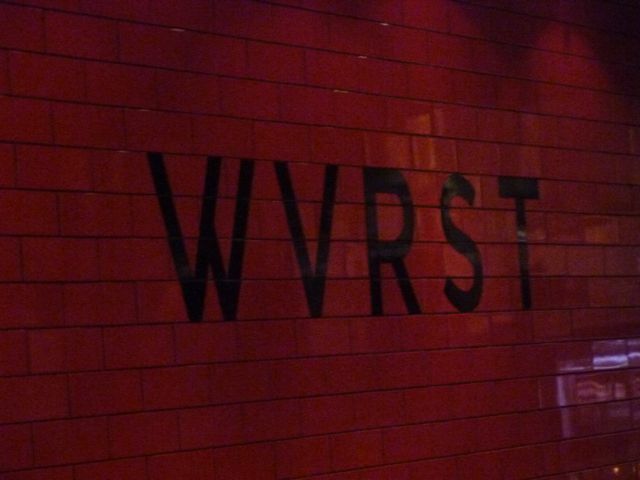 Last night, we checked out a place seemingly tailor-made for my buddy Carl: Wvrst. The name is unfortunate and the room’s acoustics are terrible (Carl and I, sitting across from each other, had to shout to be heard), but the food is great. On the menu: sausages and beer. You choose between currywurst (sausage served with a sauce that’s a tasty mix of ketchup and curry) or sausage in a bun (along with two of four toppings: sauerkraut, jalapenos, sweet red peppers, or caramelized onions), then get to choose from a variety of sausages. Carl, all smiles. I have a feeling this is going to be is home away from home while in Toronto. He'll just pack up his stuff at the hotel and move in here. The Church Key Scotch Ale. Brutal. Carl likened it to drinking motor oil. No dessert menu at Wvrst. Fortunately, Soma was on the way home. We stopped by for – oh, everything: chocolates, ice cream, flourless chocolate cake, and cookies. Carl tut-tuts my boorish behavior. Only to learn it had closed down. John was crushed. Carl having the time of his life. Akemi and her Japanese buddy. We watched a trailer for what looked like Rock 'em Sock 'em Robots: The Movie. March of the storm troopers. Dispatched for crowd control. 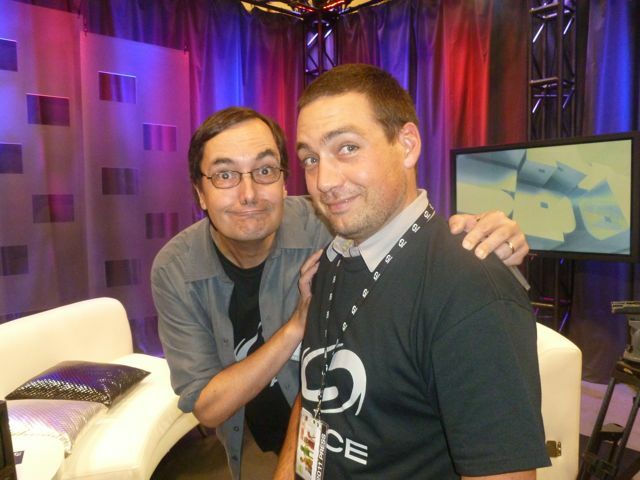 At the Space booth: Mark Askwith and fellow producer prep for the big show. As I was leaving the Space booth, I was approached by Andrew here who recognized me (and not from that America's Most Wanted episode!). We chatted Stargate for a while. 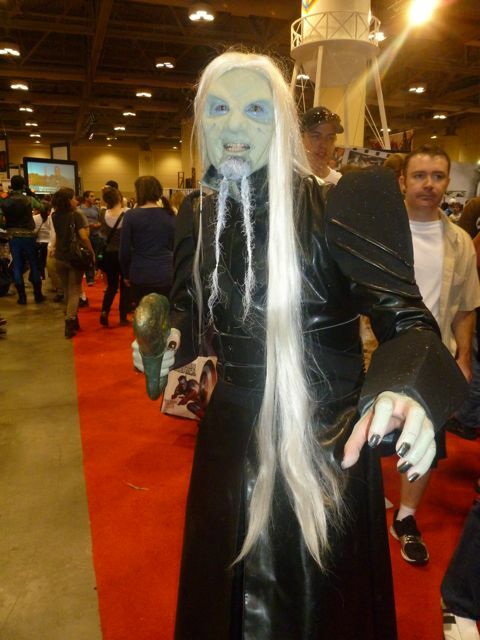 Speaking of Stargate - it was nice to see the fans representing. And a little something for Das! 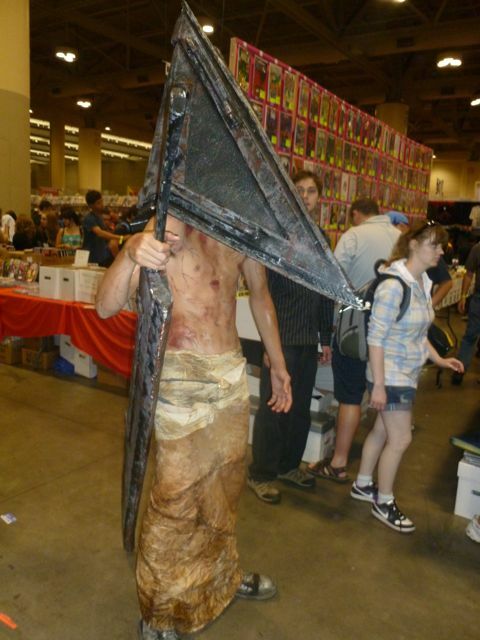 I gave myself top points for actually recognizing this character from the Silent Hill video game. 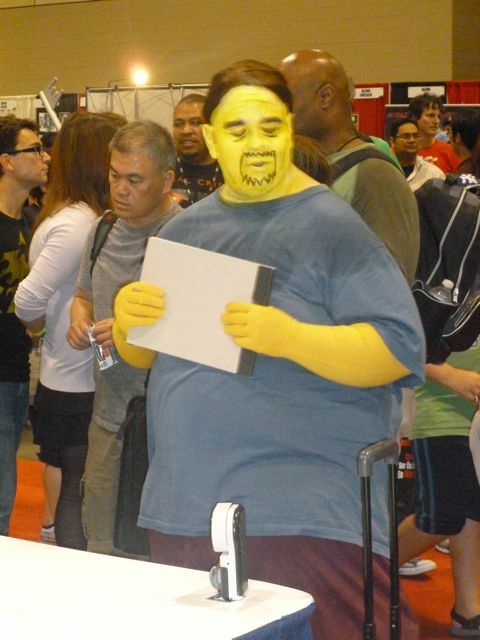 Perhaps the worst case of jaundice I've ever seen. You climb in, they lock you up, then bury you out back. Two hours later, they dig you back up. Hmmm. 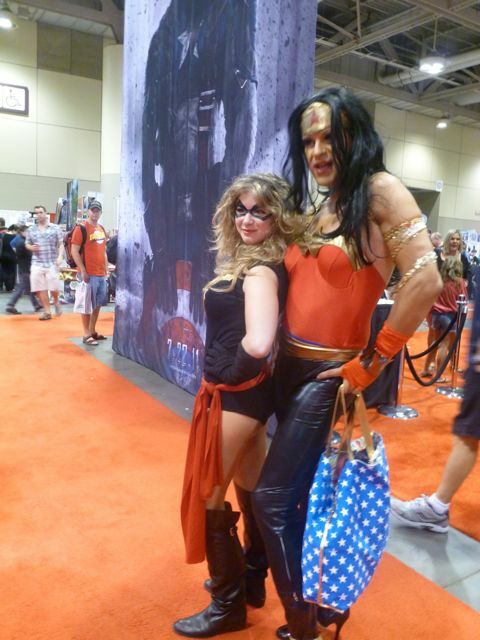 I think I know why that Wonder Woman pilot didn't go to series. 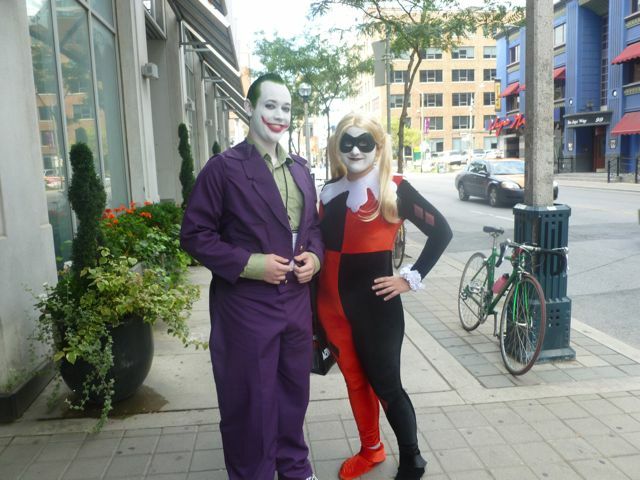 The Joker and Harley Quinn out and about. I score two more supervillain statues for my office collection: The Vulture on the left and Modok on the right. Carl calls it a day. 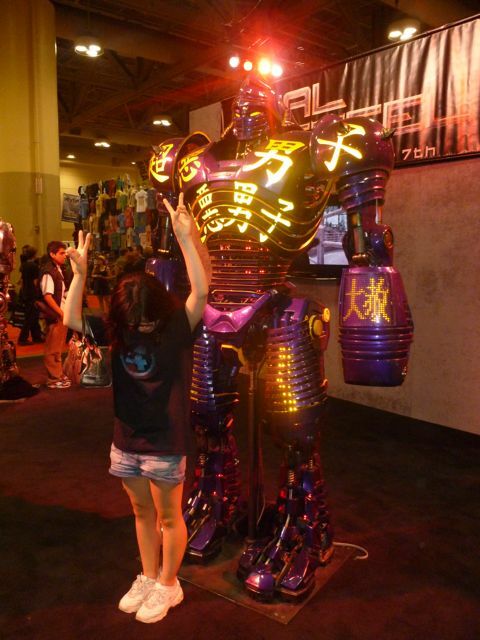 “This was my second geek festival. I think pretty successful.” – Akemi, August 27 2011. Previous Article August 26, 2011: Feeling logy! Next Article August 28, 2011: Baby! Looks like you had a great time. I found out yesterday that Atlanta’s Dragon Con next weekend would have been enjoyable—oh well, maybe next year. with the size of those models, you wont have any room in your office to work. Looks like you had a great time. At least all the walking offset the calorie intake. Few more hours and Irene will be far enough north for the winds to die. Lots of trees into houses here, but no injuries so far. Waiting to see what morning brings, and hope that irene’s losing strength translates into less damage to the Big Apple and points between. thanks for sharing the day’ makes for a nice smile before I try to head to bed. 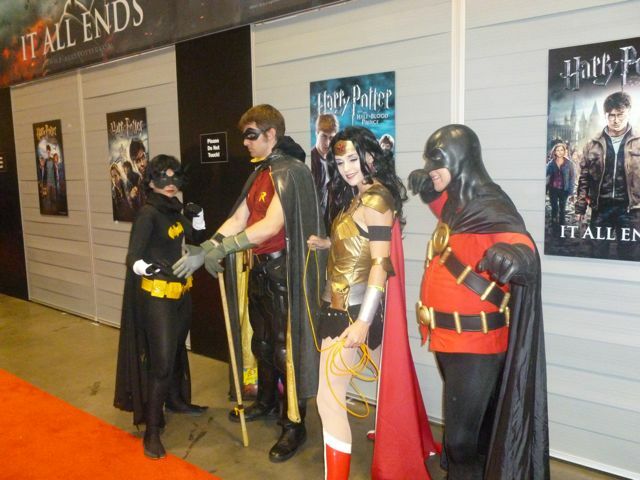 Love it…the many of us fan girls and boys who go to conventions are attending Geek Festivals….yeah! I’m in. 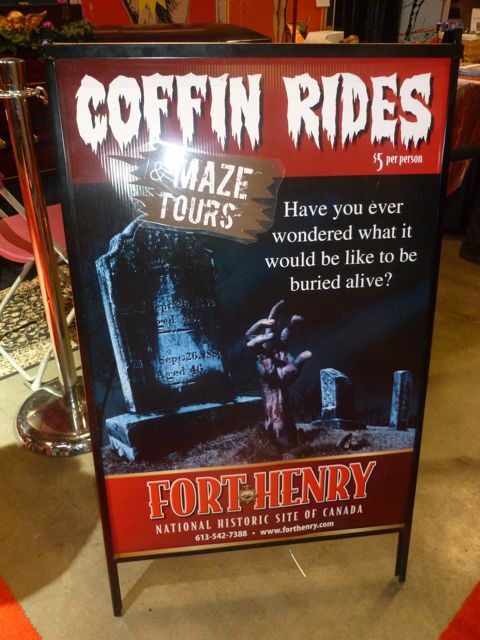 Gonna have to start thinking about other Geek places to visit. ok you got yourself something, did you perhaps get anything for Carl, he looks curious behind you…or confused. But it looked like a lot of walking and fun. And I am a bit scared to comment on the costumes, takes a lot of guts to wear that stuff in public, and they look like they are having fun?!? So you will sleep good tonight. I was wondering if you were successful in your quest to harrass Michael Shanks. His Q & A sessions are quite entertaining. It would have been great if you and Carl could have been there to ask some very good questions! 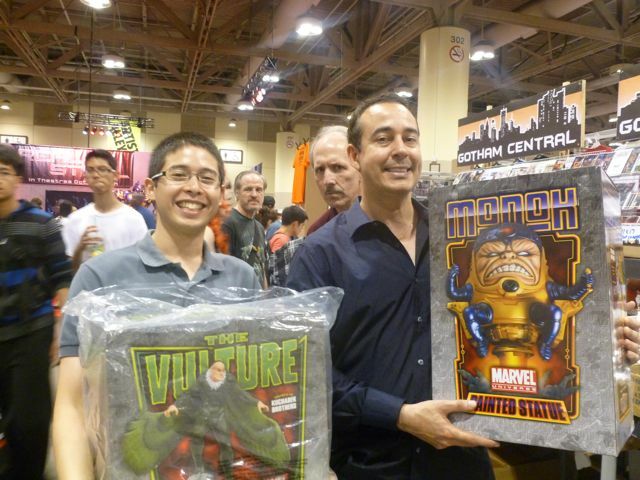 i like carl’s evil look standing behind you guys holding the supervillian statues. Carl is the resident office supervillian. Isn’t he? There’s a place here in San Antonio called Rudy’s Barbeque – Wvst’s ambience reminds me of it. Same look, same acoustics. Good food though. Looks like your geek fest was a success all around. What, no panels? Good to hear that Irene is blowing on by. Hello Mr. Mallozzi, it was a true and unexpected pleasure meeting you. I’ve been a huge Stargate fan for the last 10 years and meeting you today and seeing how gracious you were to take the time and talk to me and listen to me, it was the greatest pat on the back and acknowledgement a Stargate fan could hope for! And you posted my picture! You’re a true gentleman in your treatment of fans. Especially considering you went out of your way to introduce me to Carl Binder. What a total thrill. 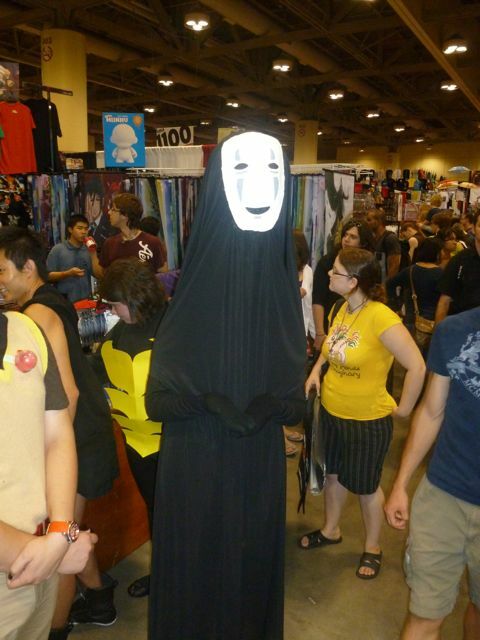 Nothin’ beats a Geek Festival. 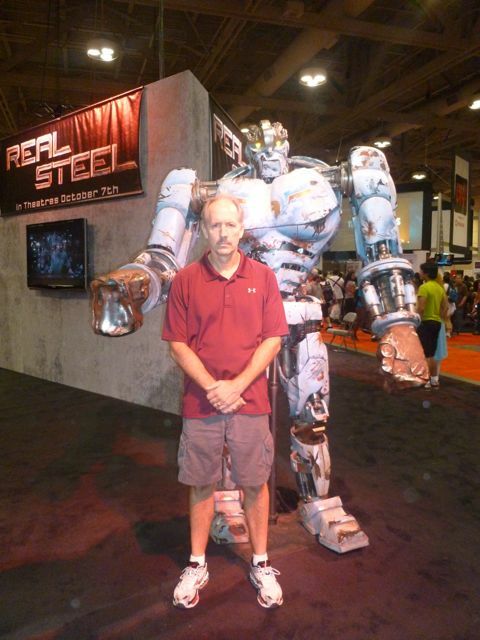 Were there people in those big robots? 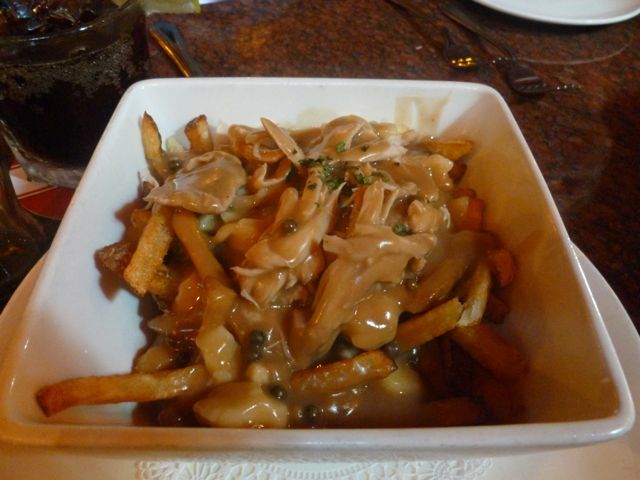 The poutine is a thing of beauty. 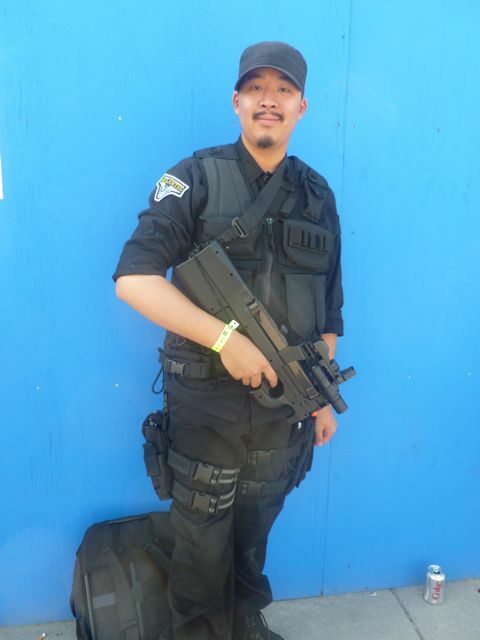 Loved the SGA dude with the P90; those were the sexiest uniforms of all of Stargate. ROFLMAO, Carl should be in front of the camera with that expressive, albeit perennially sad, face. Looks like you had a good time. @ Lisa R Dragoncon is always great, but each year gets larger and larger. I miss when it was manageable. Now, so much you get to see just a tiny portion. We aren’t going this year but I hope to next year. I only live about 45 mins away but it’s really most fun is you STAY there and that just is too much this year. How the hell did I miss you?! I was all over the Expo today and didn’t see you, despite keeping my eye out on everybody to make sure I don’t miss anything! Oh well! Glad you enjoyed it, despite how packed it was! @Debra: We will just be getting back in range of Atlanta this coming Thursday. So, too much for us this year too. i recommend dragon-con. if you’re local (or local-ish) to atlanta it’s not too late. 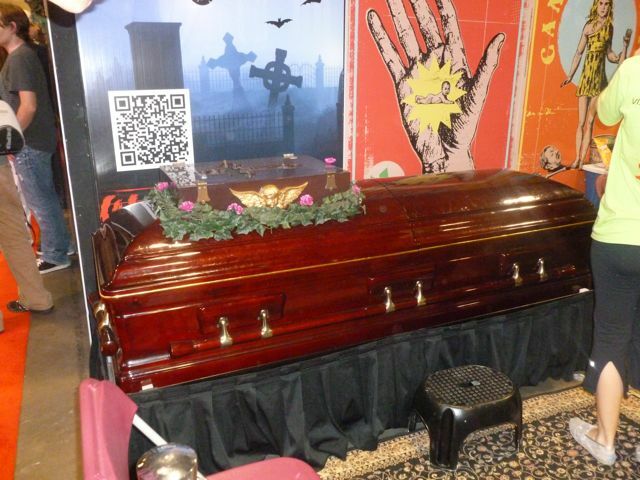 if you want to go in 2012 the hotels put the rooms at con rates for next year up in october of this year. they go fast. looks like you’re happy with your supervillain statues score. 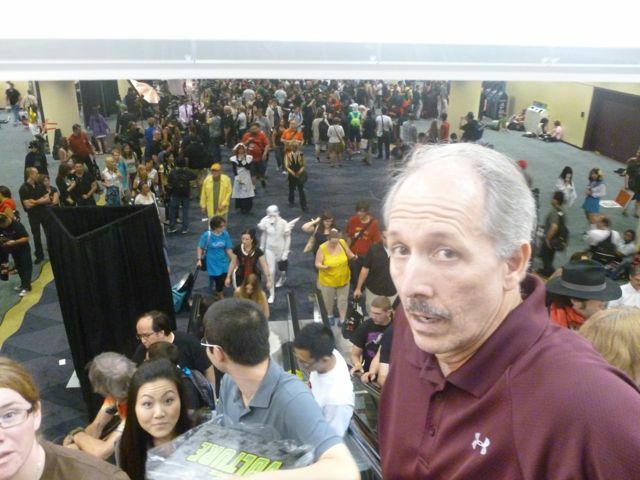 i’m amused at carl’s photobomb on you. 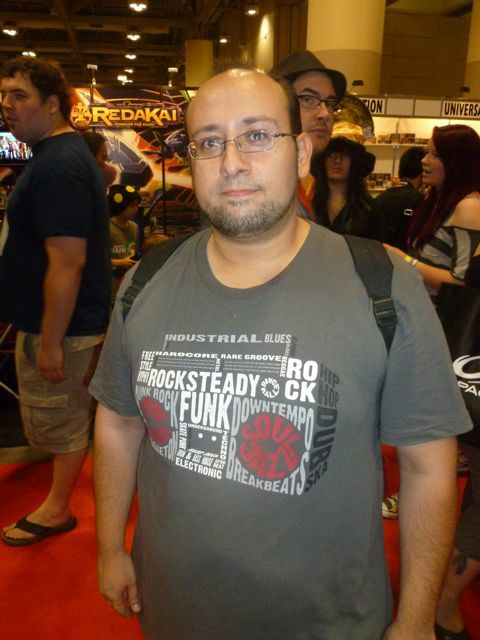 ”This was my second geek festival. I think pretty successful.” – Akemi, August 27 2011.
they get easier to survive after awhile. Place the nutritional supplements IN YOUR DOG’S NORMAL FOOD. He’ll then consume it happily AND NO ONE’S THE WISER ! So someone finally recognized you. I was beginning to think you weren’t Joe, but some Joe pretending to be Joe. I would recognized you anywhere, especially if you were with your posse – Akemi, Carl, dogs, etc. As was your Wonder Woman comment. Laughed out loud at your post several times tonight. Thx! 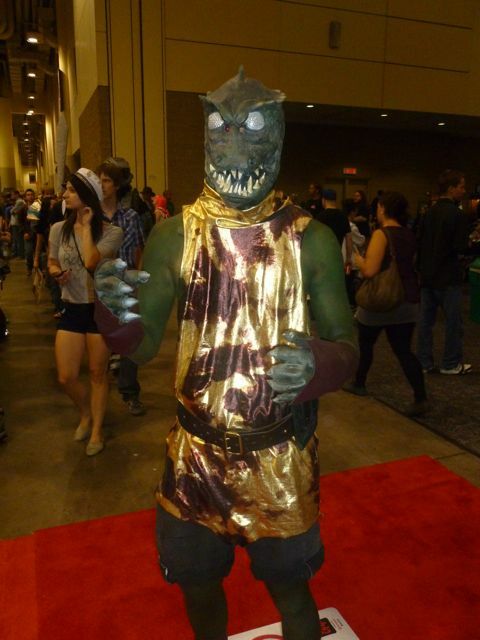 I *LOVE* GORN!! — Glaring ZIPPER in the Back and ALL!! BTW, I can NOT *believe* that YOU had to PAY to GET IN??!! — Dude! Losing Your *Touch*! Or, perhaps, Shanks left Your Pic at the Ticket Booth? After seeing Carl stone-faced in so many pictures, it feels odd to see him smile. Of course, I noticed everytime his wife was in the picture, he had a huge grin of his face. She must be a great girl. Now that I’ve seen almost every episode of the Stargate franchise multiple multiple times, I’m beginning to watch just the background stuff to see all the fun things you guys put in there as either a joke or whatever. Like today, “Brain Storm” was on and I noticed the “Carl Binder Memorial Theater” and something scribbled on one of the whiteboards called a “fork bomb”! What the heck is a fork bomb? That HAS to reference something good! How many “cookies” or “Easter eggs” are there sprinkled throughout the franchise? Too many to count, I’m sure. Looks like you had a great time, but yeah, what about the promised heckle fest for Michael Shanks? Glad to see you out enjoying yourself though. I’m sure that had to help a bit with the stresses of the last few weeks. 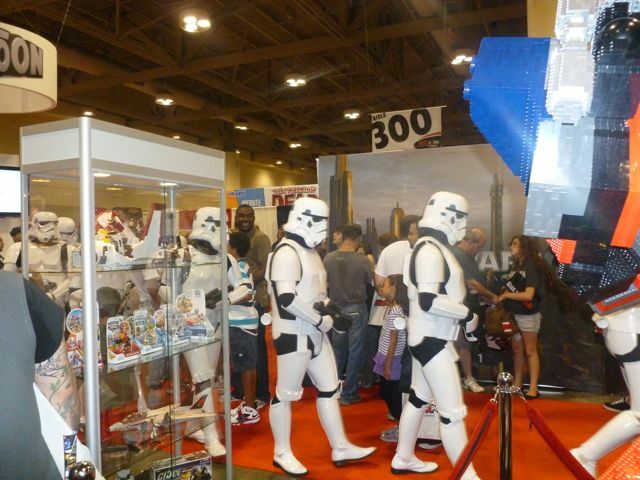 Hey Joe, I was at FanExpo Saturday as well. Sorry that I didn’t bump into you – would have made up for not being able to catch Michael due to his late arrival and the ridiculously long line that greeted him when he finally did make it. It was my first time going to an event like that, and so wasn’t sure what to expect. As much as the website says otherwise, it is still a very comic-book oriented event I think. Loved seeing all the costumes (I too ran into the dude with the excellent Wraith costume). I think the most off-putting aspect were the prices of things, from the initial tickets to the price of a beverage ($2.56 for a can of pop?! ), (my wallet) just wasn’t prepared for that. Thanks for the tip on Wvrst – will have to check it out sometime. 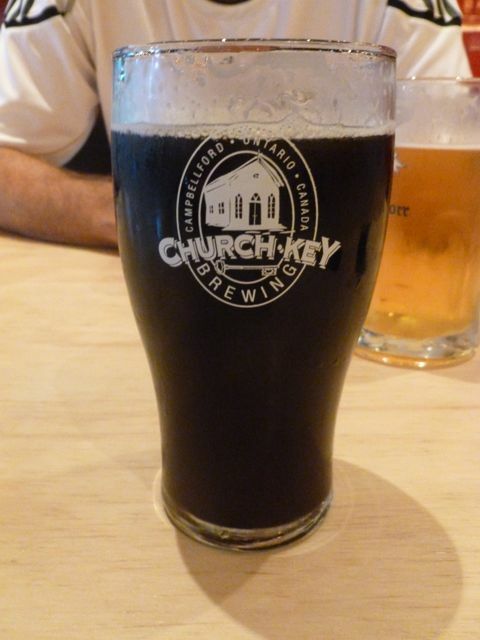 I fully agree with you on the Church-Key beer – it sounds far better than it tastes. Gave it a try at the Festival of Beer a few weeks ago, so at least I didn’t have to choke down a whole pint. If you are looking for a tasty brew with a twist, I recommend the Nicklebrook Green Apple Pilsner. Their website has a list of places it is on tap around Toronto. Anyway, if you are treating Mr. Shanks & his wife to dinner tonight, pass on a hello for me as a long time fan. Just read Jewel Staite’s blog about Buca, a restaurant she loves in Toronto. 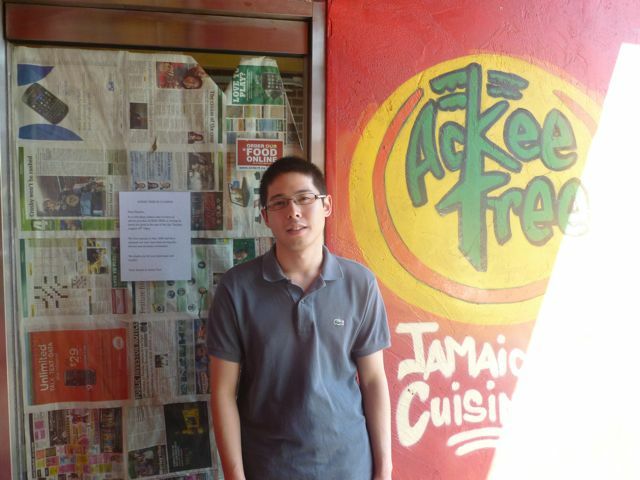 Have you eaten there yet? Based on the menu items she described, sounds like it might be a place you’d enjoy. Well, it is wet here in the DC area, make no mistake, but mostly Irene came and went without too much damage. We had leaks in our usual leaking places, but my friend EV lost part of her roof and mucho water damage. We’re thankful it wasn’t worse. 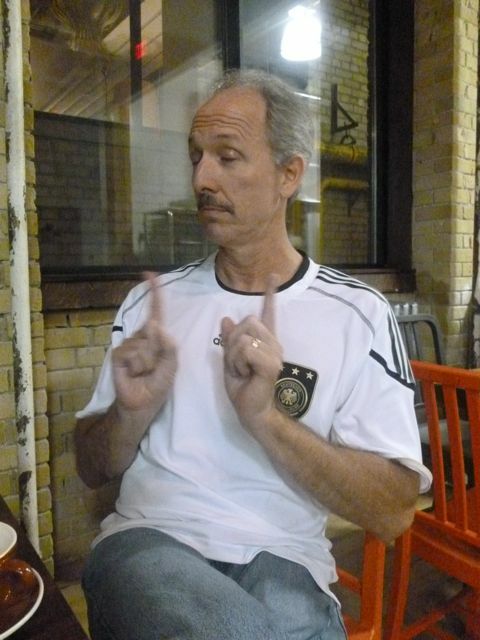 We are praying for Das and the other folks further north who are now in the midst of the rain and wind. Woo! I can finally post! (Had to update hubby’s laptop…). Safe and sound in PA – off to go antiquing. They are not letting us back to Jersey yet (my house and the feral colony survived, according to my neighbor), so we’re making a vacation out of it now. We have to pass through Philly, and the main road was still flooded, so we’re just sitting tight and enjoying ourselves for now.